Hard drives (HDD) vs Solid State drives (SSD): Which one is right for you? Both hard drives and solid state drives are devices used for storing your data; such as photos, music and software. While they do the same thing, there are pros and cons for each one due to the nature in which they store data. However, as a hard drive fills up with data, files can become scattered across the hard drive. This can result in a sluggish feel to the device you are using. Solid state drives are built for speed. They do this by storing the data on them using a motionless technology, meaning there are no moving parts. This means the data can be accessed almost instantly. They are also ideal for laptop users as hard drives can be easily damaged if you move your laptop while still powered on. They also use less power than traditional hard drives meaning your battery lasts a lot longer. The downside to Solid States Drives is the cost. They are a little more expensive compared to traditional hard drives. If you are not using all of your existing drive space, then seriously consider swapping it for an Solid State Drive. It is much faster compared to traditional drives, and you can use your existing hard drive, as a external drive, for backups, so it does not go to waste. The bottleneck on most computers comes from the hard drive, so if you are looking at speeding up and improving the performance of your computer, and have less than 200GB of data you want to keep, it’s worth upgrading to an Solid State Drive. However, if you have a lot of data and want to keep costs down, a traditional hard drive would be okay though. Consider this though, if you have a desktop or laptop a couple years old and are really looking for a speed boost the part to upgrade is your hard drive. Solid State drives can easily breathe new life into your computer and give you over 10 times the speed; saving you the trouble and cost of replacing the machine. Interested in upgrading to an SSD? Fill out our Contact Form or give us a Call. We will be glad to help! In the famous words of Joni Mitchell, “You don’t know what you’ve got until it’s gone.” Unfortunately for many home computer customers, not having a reliable data backup solution is a painful lesson to learn. As we all become increasingly dependent on our digital files, having a copy, or multiple copies, of those files is a crucial element of keeping your data safe. The data on your computer or mobile device can disappear in an instant – succumbing to accidental deletion, corruption, malware encryption or theft. The best way to prepare for a data disaster event is to make sure that you have a workable, reliable and verifiable backup solution in place. The first thing that you need to do when considering backing up your data is to find a solution which works for you. People use their computing devices differently, and therefore a backup solution should work with your computing experience. Are you the type of person who prefers to control exactly when you backup your data or would you rather “set it and forget it”? Do you prefer having your data close by, say on an external hard drive, or would you rather have it available 24/7 via the Internet? Does your data reside on just one computer or on multiple devices? Answers to these questions will help you decide on the best backup solution for your situation. Your backup needs to be automatic. Life is too busy for most of us to consistently remember to start backing up our data. Most backup software and services, though, can be scheduled to start automatically. Some programs even backup instantly every time a file is added or changed. Don’t let it be your job to remember to plug in a storage device or to kick off a backup routine. Let your chosen solution take care of that work for you. Your backup should be verifiable. Many people have a backup plan in place, but unfortunately not many have a restore plan in place. If you are not sure whether or not you can successfully recover the files that you have supposedly backed up, then you don’t have a backup plan! Part of your backup routine needs to be periodic testing to make sure your backups are valid. This may be doing something as simple as restoring one of your files or folders to an alternate location on your computer. If you can regularly successfully restore files from your backup when you don’t necessarily need them, then chances are better that you will be able to restore them when you do need them. Your backup should Include versioning. It may not be enough to have just one copy of each of your files. As many who have been hit by the Cryptolocker infection have discovered, backup solutions which don’t keep multiple copies of files as they are changed are susceptible to being overwritten by malware. Therefore, it is important that your backup solution allows you to restore copies of your files from various points in time in the past. Your backup should be secure. Do you keep thousands of dollars under your mattress because you feel it’s more secure than keeping your money in a bank? Many people follow a similar strategy when it comes to protecting their data. Don’t assume that your data is secure just because you have a copy of it on an external hard drive attached to your computer. Hard drives can fail at any moment, can be stolen or can fall victim to a virus or a power surge. However, cloud-based backup solutions are, for the most part, much more secure than onsite backups. Most offsite backup solution providers keep their customers’ data in tier 1 data facilities with multiple levels of security controls, encryption, environmental protection and co-location. It is safe to say that your data is better protected in one of these “data banks” than under the proverbial mattress in your home. Crespo IT Solutions has two different backup solutions that we recommend. We offer two solutions because each of them is able to cater to the different backup needs of our customers. The first solution that we offer is Backblaze. This backup company has been in the business longer than most of the others, and it has a reputation for simple, affordable backup services for residential customers. Backblaze’s user interface is very easy to understand, and customers are able to determine whether or not their data is secure just by looking at the file names on their computers. Backblaze also gives you the option to backup to an external hard drive as well so you have a local copy on your PC as well as one on the cloud online. Backblaze offers unlimited backup for your home computer for just for just $5 per month per computer. You can also pay $50 per year and get 2 months free. The second backup solution that we offer is CrashPlan which offers both local backup and complete system recovery as well as storage of your most critical files locally and in the cloud. While the cost is just a little more than Backblaze, CrashPlan allows you to protect multiple computers under the same plan and share backups with a family member or friend. Therefore, if you are a household with 1-5 computers, this backup solution would probably work better for you and would be cheaper in the long run than Backblaze. Furthermore, CrashPlan is monitored regularly. That is, we will take on the responsibility of making sure that your devices are being backed up and that your data is able to be restored when needed. The cost for Crashplan ranges from $5.99 for 1 PC or $59.99 per year. When you add the Family Plan which can cover anywhere from 2-10 Computers it is only $13.99 per month or $149.99 for an annual subscription. 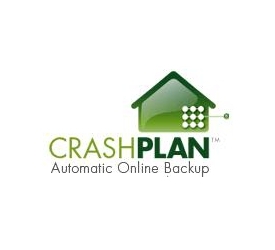 CrashPlan just like Backblaze offer Unlimited Data Backup and they meant it! You do not have to worry about how much data you have. CrashPlan will back it up to its’ online servers along with your external hard drive if you choose to do so. I have personally used Crashplan on my computers for 3 years with no issues and I highly recommend it. Both of these backup solutions provide automatic, scheduled backups to a secured data center, easy restoration procedures, versioning and 24×7 access to your files from anywhere via the internet. They also have iPhone Applications that allow you to view your files where you are. Making sure that your data is backed up securely is not a difficult task in today’s world. However, it does take a bit of planning and initiative on the front end. However, when a data disaster strikes, you will be glad and grateful that you have a solution in place. Crespo IT Solutions is here to help. Allow us to help recommend the best option for your needs and set it up Remotely for you. We can get this done quick and easy for you while you watch. We also the offer the option to monitor your backups when your Sign Up for our Protection Plan.